Many researchers have commented upon the possible relationship between the Martellus 1491 (D03 & D04) and Waldseemuller 1507 maps/chart (D05), particularly as the presentation of both appears very similar, including the external bordure. Both charts also exhibit a peculiarity in the design draughtsmanship of the African Continent when it is documented that the Portuguese had established its form at least to the Gulf of Guinea by 1491 and completely before 1507. Both charts then use the Ptolemaic Middle and Far East, although that is a guessed profile based on the Ptolemaic information. 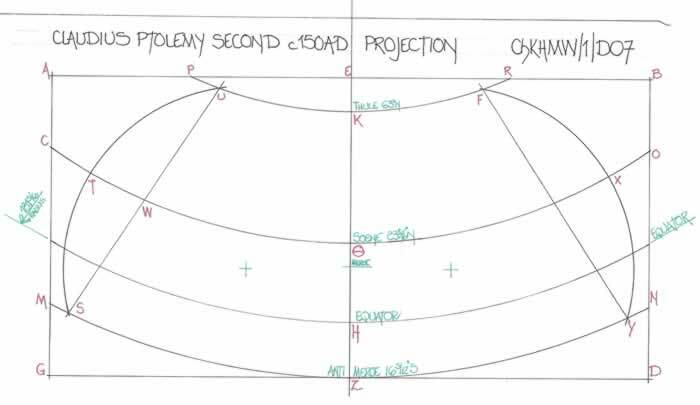 These charts are variously called Pseudo-Cordiform or Pseudo-Ptolemaic projections, but that belies their actuality being plainly just a curvilinear drawing design base on Ptolemy’s second projection. Before those charts are discussed, the 1489 printed versions (D02) of which there are several extant copies, with each being only c290 x 430mm, but the 1491 chart is c1220 x 2010mm and the 1507 chart in composite format some 1350 x 2415mm or around five times larger than the printed Martellus versions. To ensure a logical explanation this text commences with an explanation of the Ptolemaic first and second projections and clarifies the Ptolemaic zero longitude. It then discusses the King-Hamy 1502 chart (D01), Martellus 1489 (D02) and finally the Martellus 1491 (D03 & D04) and Waldseemuller 1507 chart (D05) by subjecting them to the exploration of the draughting methods and presentation test. 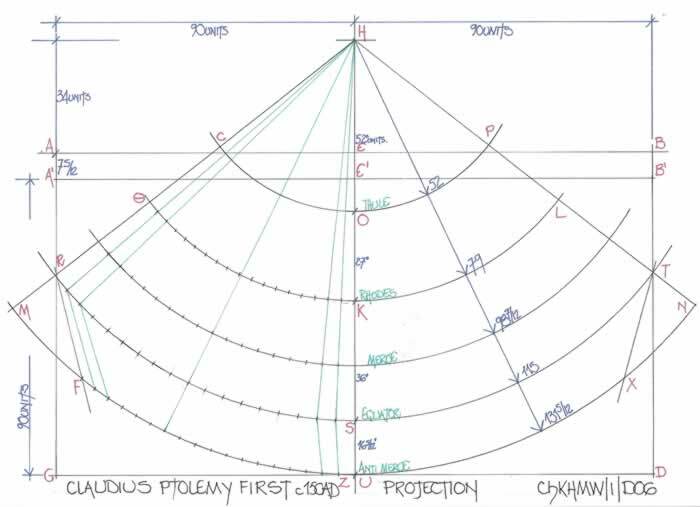 Within Ptolemy’s chapter 24 the instructions are quite explicit to enable the two projections to be set down by a competent draughtsman. The First Projection however commences with an un-necessary instruction which is phrased; “Let us fashion a (planar) surface in the shape of a rectangular parallelogram ABGD with side AB “approximately” twice side AG.” A rather ridiculously phrased instruction; what is approximately? Actually the rectangular parallelogram ABGD is totally un-necessary and is probably the result of the diagram being completed by Ptolemy and afterwards he has used it to write his text without realising the conflict. 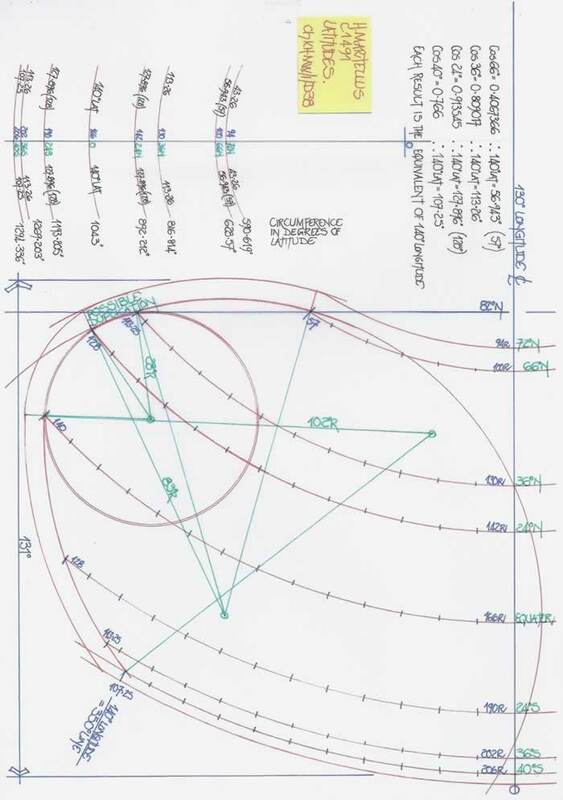 Confusing as this part possibly is, ignore the ABGD and commence from the vertical centreline, H/Z or U as the whole form of the first projection is set out from this line, as diagram ChKHMW/1/D06 clearly illustrates and is fully dimensioned as per the Ptolemaic text. 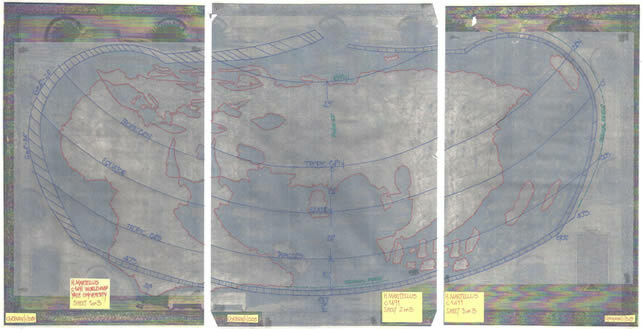 The Second Projection is indeed set out in a rectangle ABGD, but primarily from the centreline L/Z as the diagrams ChKHMW/1/D07 and D08 clearly illustrate. Thus it is quite obvious and open to opine that the second projection is in fact only very slightly modified for the Waldseemuller 1507 chart. The Martellus 1489 printed charts are, in their final form no more than an inverted first projection as will be clearly shown later and thus of course the Martellus 1491 chart is also the curvilinear second projection. 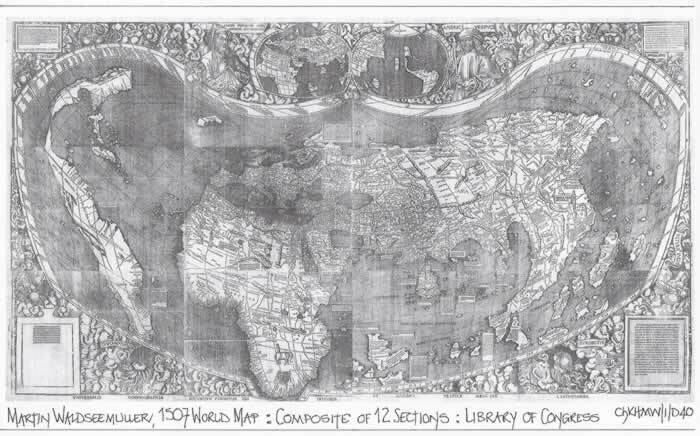 Thus armed with that definitive information the following sentence should be expunged from the record; quote; “This map (1507) is actually a prototype of a (truncated) cordiform or heart shaped projection” Complete and utter nonsense and requires deleting. To put it plainly, both Martellus 1491 and Waldseemuller 1507 charts bear only a small agreement to Ptolemy for the North-West coast of Africa from Cotes Promontory, 6E & 35.55N to Hypodromus Aethiopia, 14E & 4.00N as Diagram ChKHMW/1/D09 illustrates. It is therefore patently obvious that both Martellus and Waldseemuller have stretched the NW coast of Africa to 10 & 20 degrees below the Equator and thus it cannot be in any circumstances considered a Ptolemaic plot. Only the Mediterranean Sea would appear to be based upon Ptolemy’s work. Thus there is a fundamental change which must be explored and quantified by comparative research. Thus Eratosthenes determined his zero longitude as 2000 stadia west of the Capes of Iberia (90 35’W) which at 360N adds some 3 ½ degrees. Thus geographically the zero longitude is c130W, but the bulge of West Africa at Cape Vert/Dakar is 17.50 geographical. Marinus the Tyrian (Mt1, Mt2) as recorded by Claudius Ptolemy ( texts Cp1 to Cp4) in his “Geographike Hyphegesis” lists the oikoumene length commencing with 2.50 or 1000 stadia to the Sacred Promontory of Iberia (Cape St Vincent, one of the Capes of Iberia), at 90W geographical. And thus we have the data which has caused a long argument. But the etymology of the names suggests the Canary Islands are meant. Obviously Canaria is a given, but Pluvialia meaning rainy could apply to Tenerife which has 250 mm rain in December. However, Ninguaria which is Latin for snowy probably refers also to Tenerife because of the snow on Mount Tiede. Capraria means “goats” and is probably Fuerteventura and Inaccessa, Isla de Alegranza. But the etymological argument cannot disguise the fact that they are geographically 280N and not in the range of 100 30’N to 160N as in the text. Marinus/Ptolemy use three very distinct parallels accurately placed juxta each other. They are 310N, Alexandria; 380 15’N, Sacred Promontory; 430N, Byzantium. They are dimensionally correct and can thus be used as a latitudinal basis to evaluate the Beatorum Islands. (Ca1) Their latitudes came originally from sailing distances which were no doubt recorded north/south along the west coast of Africa. Thus by constructing a map of West Africa and juxta-posing the geographical plot to the Marinus/Ptolemaic plot we can establish the actual islands of the Zero Longitude. The diagram illustrates that situation and confirms that the Zero Longitude Islands are in fact the Cape Verde Islands which are set from 15/170N and 22/250W Geographical. Therefore it is possible to opine that two sets of Islands, the Canaries and the Cape Verde’s were coalesced into one group in ancient times by the amalgamation of the geographical data for the Cape Verde’s and the names/descriptive nouns of the Canary Islands. Curiously there are six Beatorum Islands and six islands in the main Cape Verde Group (Barlavento). But we are told that the Portuguese discovered the Cape Verde Islands in c1460CE. However in 1579, Christopher Saxton on his map of England and Wales chose to use the Cape Verde’s as his zero longitude (text Cs1). Note; this text is dated 2010 and was published in “Maplines”, British cartographic Society. It is based upon the texts CP/1 to CP/5 in the cartography section of the website. Therefore where did both Martellus and Waldseemuller obtain data that in 1491 and 1507 was compelling enough, firstly for Martellus to change an acceptable Africa as drawn on the Florence 1489 chart, then amended for the later engravings and publication, but maintaining the excellent NW African profile. Then in 1491 extend the coastline to 10 degrees below the Equator only for Waldseemuller to extend his chart 20 degrees below the Equator. Thus an overall investigation is required to evaluate possible sources or reasons that could have led to this gigantic and un-necessary error. 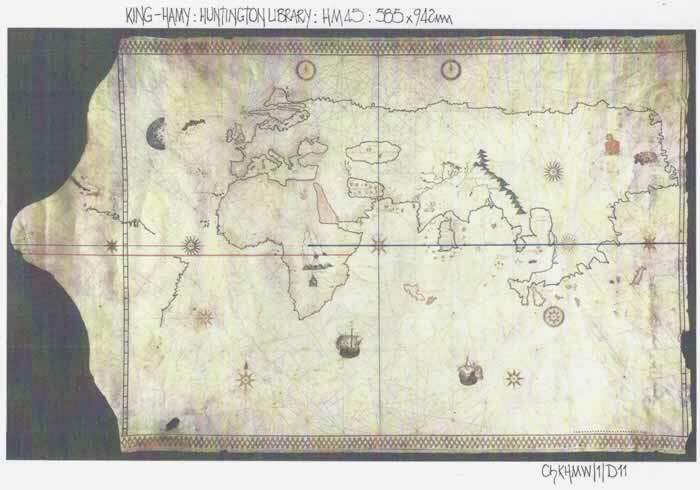 THE KING-HAMY 1502AD CHART; HUNTINGTON LIBRARY, HM45 PARCHMENT, 585 x 942mm; chart 530 x 772mm. “The anonymous sea chart known as the King-Hamy map is an intriguing piece in the puzzle of Joao Fernandes’s voyages, for it is the earliest-known map with reference to the Labrador himself. (Jaoa Fernandes, charter from Portuguese King in 1499.) 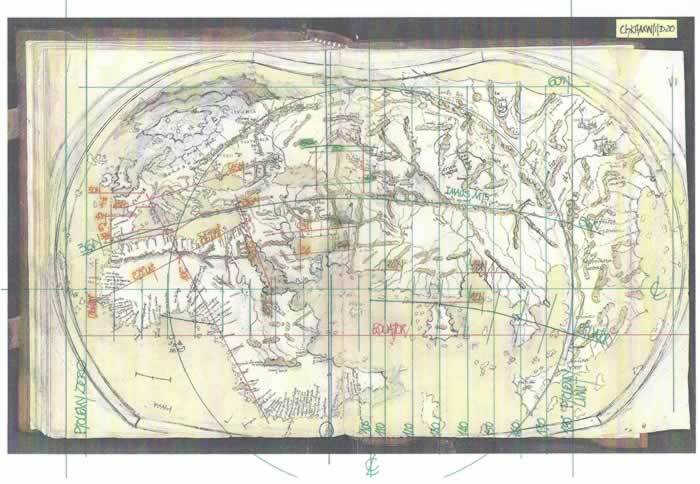 Some 30 years ago R A Skelton judged the map to be post 1503 Italian, rather than Portuguese, and while this assessment is open to debate, his discussion on early maps relating to Williamsons Cabot treatise is still a mine of useful information. 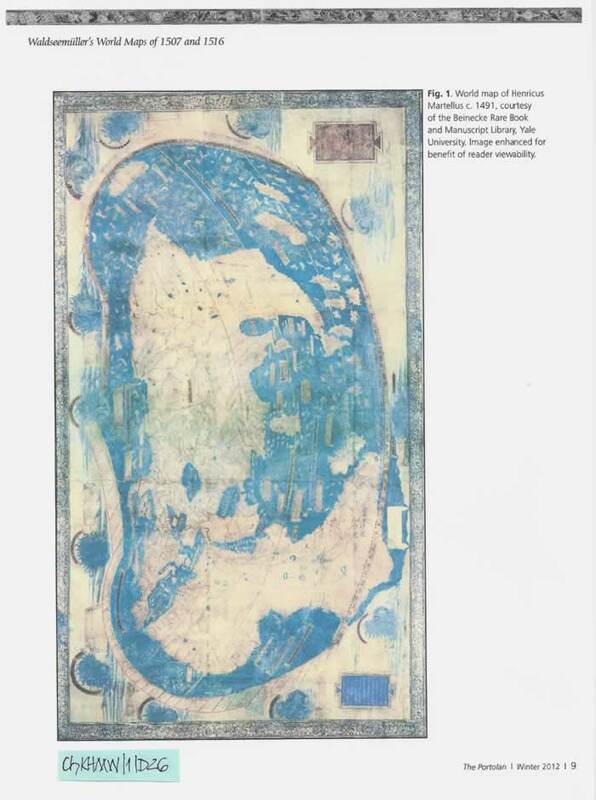 He noted the radical departure from the known Portuguese tradition in the King-Hamy chart depiction of Greenland as an elongated east/west trending island rather than as the northernmost promontory of an Asian Mainland; This island is clearly labelled ”Terra Laboratoris”. Two other surviving maps, also anonymous, show a similar island named for Labrador. The chart itself is Diagram ChKHMW/1/D11 on which is indicated the dual Equators. An analysis of the chart is as ChKHMW/1/D12, firstly by the dates of exploration it shows that there are probably five distinct sections; Europe c1300; Africa c1480/1500; West Indies c1495/1500; Ptolemaic East c150AD and the Far East additional to Ptolemy c1480 to 1500AD. 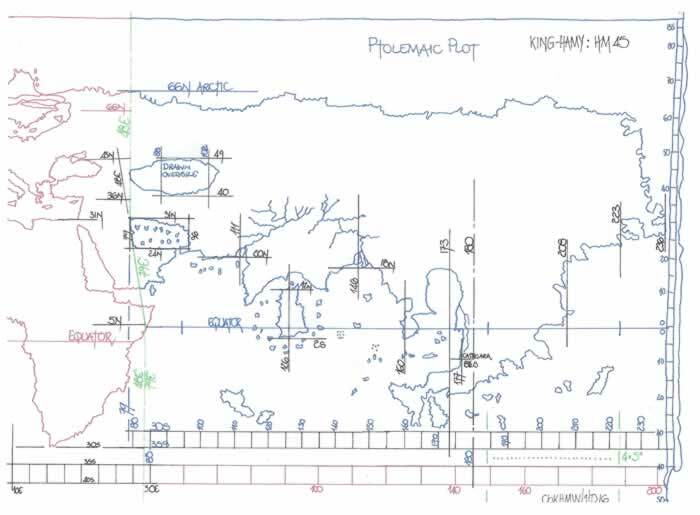 Thus it is possible to draw the basic Ptolemaic rectangle whilst noting the change in geographical co-ordinate usage to Ptolemaic co-ordinates at 48E geographical becoming 79E Ptolemaic which then continue to the Far East section of the chart. The King-Hamy chart has in the southeast corner a series of dots which are in fact its scale bar to be used with the vertical latitudinal scale which is set through the West Indies and mimicked by the eastern bordure which is similarly divided. However the two Latitude scales are set five degrees (?) apart, as will be discussed later. The basic Windrose graticule is shown on Diagram ChKHMW/1/D13, where as usual the minor sub-division line which would be 7 geometrical units out of the 92 units is omitted. The King-Hamy chart setting out as shown on ChKHMW/1/D14, is a simple rectangle based upon a central square of 24 digitus. This provides for a very simple sub-division of the square geometrically to provide the actual wind-lines and then extend the square to a basic rectangle of 36 digitus as set out on the diagram. The wind-rose graticule has been drawn to illustrate that basic setting out, a square extended to a rectangle, and the height of the chart is precisely the “diameter” of the wind-rose and thus a dimensional certainty for the internal construction. The full analysis of the charts inner construction is on two Diagrams, ChKHMW/1/D15 and ChKHMW/1/D16 which have been drawn to indicate the geographical plot and the Ptolemaic plot with the latitudes and longitudes of both sections. Obviously the most important factor to evaluate is the Double Equator set 5 (?) degrees apart as is clearly indicated by the two vertical latitudinal scales. The overall chart may be described as being latitudinally from 40S to 90N and longitudinally from 85W to 236E. 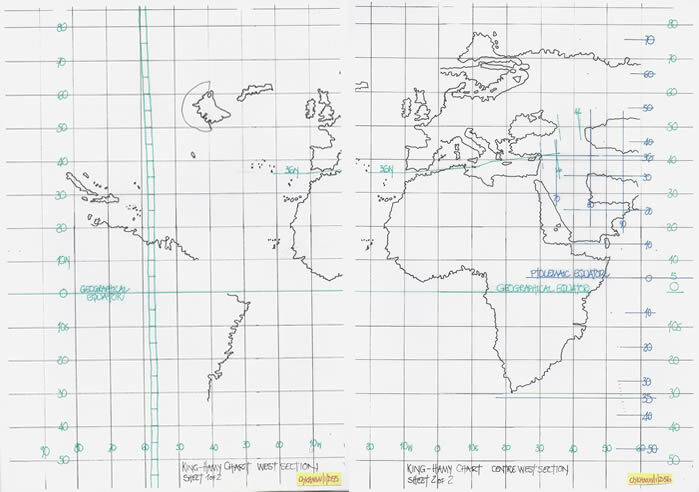 But most importantly it is a square graticule chart with equal Latitudes and Longitudes. Europe however has been drawn similar to many Portolan Charts with an error induced anti-clockwise twist and unfortunately the Mediterranean Sea has been drawn to 40 degrees longitude when it is actually 45 degrees length from 9W to 36E geographical. The diagrams have copious numbers of measurements and co-ordinates to avoid the necessity of a long textual description. 1) Florence; Biblioteca Medicea Laurenziana, Pluteo 29.25 ff 66v-67r, 290 x 430mm. 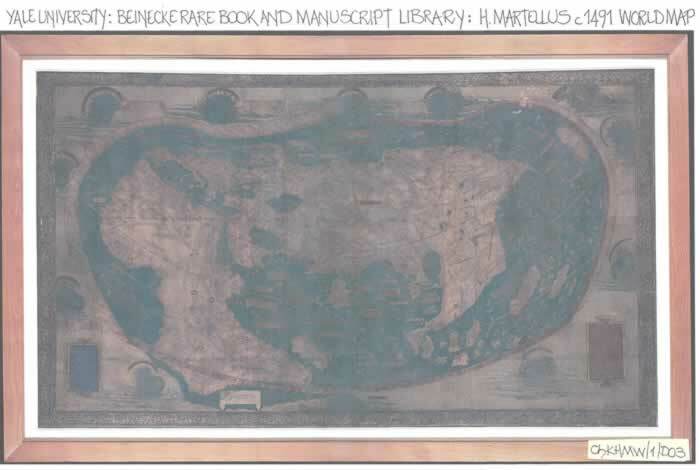 There are four manuscripts extant plus a supposed draft manuscript (1) and are part of “Insularium Illustratum” (Book of Islands) by Henricus Martellus, a geographer and cartographer who lived and worked in Florence from c1480 to 1496. The manuscript charts are basically the same chart on slightly differing parchment sizes and were produced in Florence, and were engraved by Francesco Rosselli for printing purposes. The Yale world map is not in the best reproductive state and the enhanced version has been used as well as the original for this text. 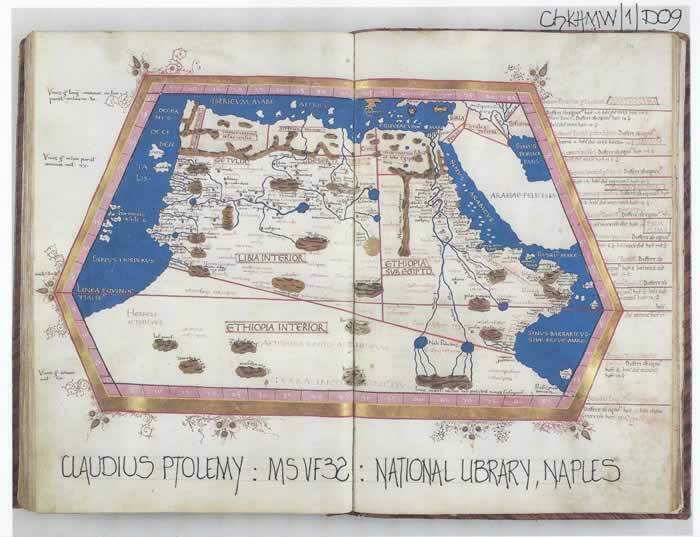 To be precise for other researchers to study, the surviving works extend to two manuscripts of Ptolemy’s Geographike Hyphegesis; five manuscripts of Insularium Illustratum, Laurenziana; JCB library MS B1475MA; Universitests Bibliothek MS Voss Lat F23; Bibliotheque du Musee Conde MS 698 and BL Add MS15760. 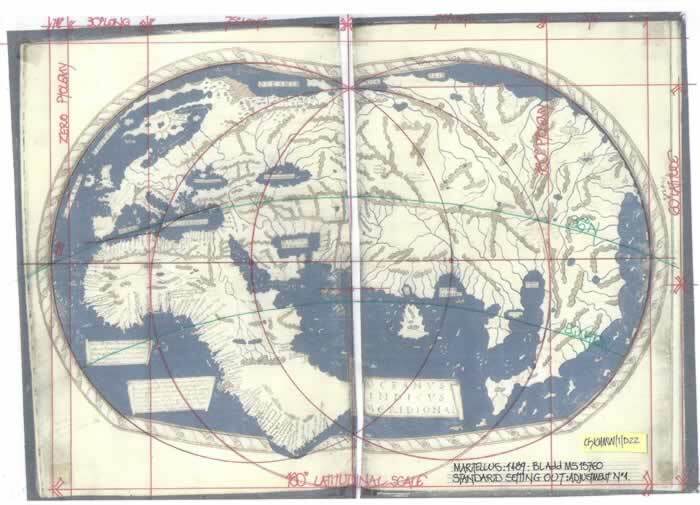 The two world maps are held in Landau and Yale. This chart which is only c290 x 430mm has been altered by Martellus (diagram ChKHMW/1/D17), perhaps just to fit onto the parchment sheet. There is but one longitudinal line, semi-circular which represents the 180 degrees of Ptolemy. Traces of the original Equatorial line can be seen just above the scale bar in the SW corner. As can be readily observed several parts of the chart have been amended, generally in the north and north-western sections but also the extremity of Africa. There are in fact two scale bars; the upper is two sections of five degrees latitude and the lower, a double pecked line is actually four degrees longitude on the top of the line and five degrees latitude on the lower side. Thus the actual setting out of the chart can be assessed as is shown on the diagram ChKHMW/1/D18. 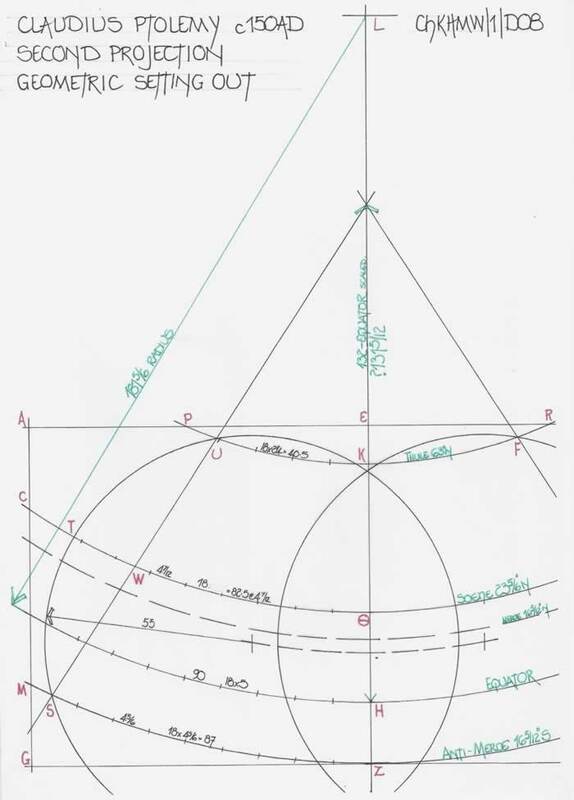 From the centre-line the radii for the construction are 60 latitudinal degrees with the original 180 degree Ptolemaic line having a 75 degree radius. 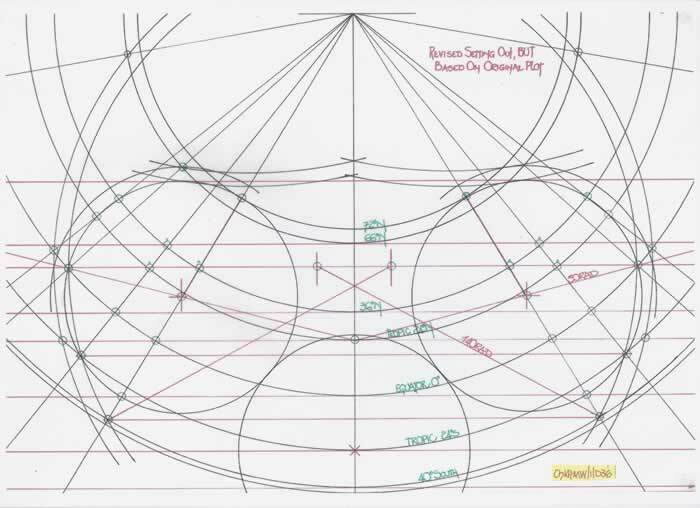 From the central 120 degree diameter circle the extremity of the chart is set out via 30 degree extensions and the longitudinal measurements are thus easily determined. 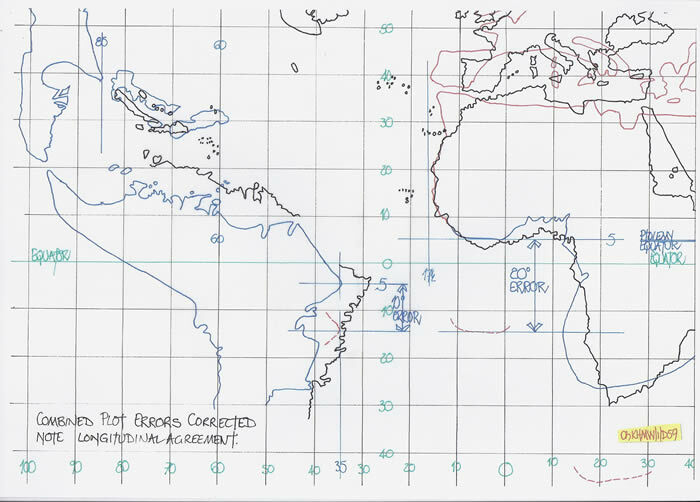 However, there is no agreement for the charts setting out construction with the original Equatorial Line and instead the whole set of Latitudinal lines are an inverted Ptolemaic concept based upon the First Projection as can be clearly shown by diagram ChKHMW/1/ D19. The overall setting out is the same, but instead of a northern radius point it has been moved to a southern position and all is amply proven by the 36N latitude which curves to neatly delineate the Mediterranean Sea as portrayed with a slew on Portolan Charts and then onto the Imaus Mountains of Northern India all as per the Ptolemy profile. The final diagram ChKHMW/1/D20 has the longitudes set out in a vertical format and it can be clearly seen that the Portolan Chart skewing of the Mediterranean Sea has influenced the setting out and thus Africa is expanded eastwards to suit the Geographical 36E, which is Ptolemy’s 69 1/2 degrees east. But the geographical 10E, which positions the west coast of southern Africa is correctly positioned and thus the raison d’être for a tilted Africa! The addition of this chart is included to illustrate the missing fold flap on the BL ADD MS 15760 chart and confirms it is an identical print as would and should be expected. 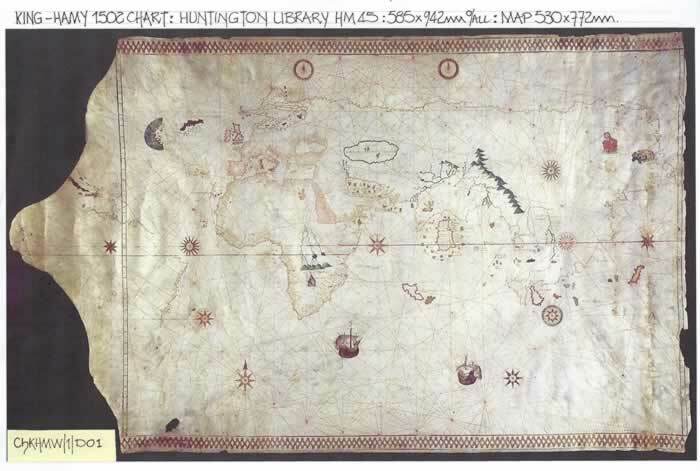 YALE UNIVERSITY; BEINECKE LIBRARY WORLD CHART, 2010 x 1220mm. There are numerous diagrams as follows; Diagrams ChKHMW/1/D03 & 04 +D26 to D38 which explain the whole being of the c1491 world map. Unfortunately this chart in its present state proved quite a challenge and to illustrate it I have had to resort to tracing overlay highlighting the coastlines. Thus the first three diagrams, ChKHMW/1/D27 to D29, which overlap to form the whole, illustrate the chart extant as best possible, without comments. The second set of three diagrams, ChKHMW/1/D30 to D32 set out the latitudinal arcs and illustrates that there is a scaling error in the south west corner of the lowest arc. To produce a symmetrical chart it is drawn from 350 degrees to 270 degrees, as Diagram ChKHMW/1/D33 illustrates which gives a centre line at 130 degrees, however the error from the 350 mark to the Zero mark causes a bordure setting out error. Then diagram ChKHMW/1/D34 sets it out correctly. 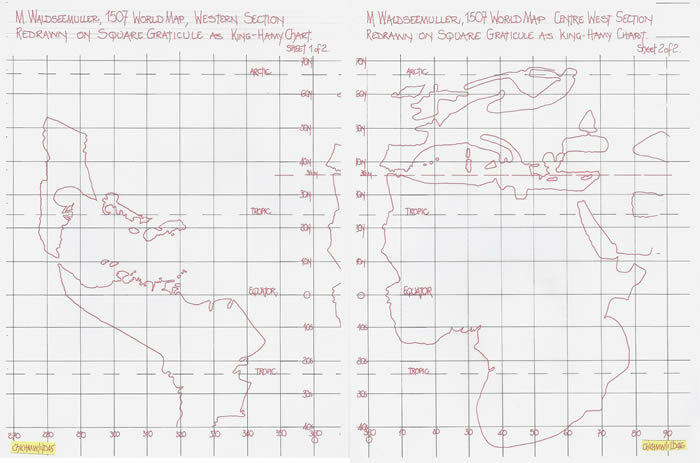 Study the first and fourth diagrams in this series, particularly the North West coast of Africa where the extended length is so very apparent and places the northern coastline of the Gulf of Guinea, or the southern coastline of West Africa 10 degrees south of the Equator, when the correct position for this coastline is 5 degrees north of the Equator. That is a 15 degree error in latitude, when the Portuguese have correctly positioned this coastline for a decade. That means the position of Cape Verde is drawn only 2 or 3 degrees north of the Equator when it should be nearly 15 degrees north and hence could be considered to be correctly positioned apropos the Gulf of Guinea coastline. Thus it is open to opine that this confusion probably emanates from the dual Equatorial lines, one for the Ptolemaic plot and one for the Geographical plot. However, on the eastern coast, the Horn of Africa is set close to its geographical latitude of 12 N.
If therefore we move the Gulf of Guinea coastline northwards by some 15 degrees the southern portion and continuous coastline will move the southern tip to approximately 35 degrees north, its correct position, and thus it will become the Laurenziana chart where-on NW Africa was drawn quite accurately. The abandonment of the Laurenziana plot for the later examples (although we are informed they are all dated to 1489) where Africa bursts through the bordure was probably instigated by Martellus viewing a chart which confused the Latitudes, possibly a fore-runner of the King-Hamy 1502 chart, but it was obviously so convincing that the correct plot was abandoned. 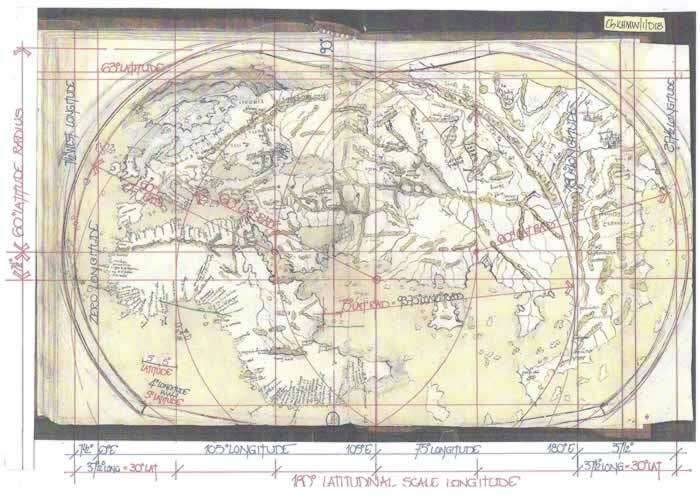 Thus if the Yale University chart is correctly dated at 1491, then around that period another draughtsman was morphing Geography and Ptolemy by varying the Equatorial line to balance the scale variation and two actually incompatible plots. Thus on the diagram ChKHMW/1/D33 the setting out is illustrated as drawn but on the diagram ChKHMW/1/D34, an overlay endeavours to correct the plot. But note; the setting out is 140 degrees either side of the centreline, set at 130 degrees and the radius for the 36N latitude is 130 degrees with the side bordures having a radius of 140 degrees. I have indicated the single degree possible error in this work, but as it is so minute in comparison to the whole it should be ignored until a full size copy of the chart can be accurately measured. Then diagram ChKHMW/1/D35 illustrates the variations in the setting out displayed by colour coding for easy reference and diagram ChKHMW/1/D36 illustrates what should have been achieved by the original setting out had the accuracy been maintained. Then diagram ChKHMW/1/D37 merely illustrates the errors in the longitudinal setting out which varies the eastern and western bordures to the detriment of the charts accuracy, but diagram ChKHMW/1/D38 sets down correctly the cosine calculations for each latitudinal line illustrated there-on and the possibility that a correctly set out bordure would have had excellent geometric credentials. Henricus Martellus has chosen to draw a relatively correct map for his “Insularum Illustratum”, no doubt using the latest Portuguese survey information and melding it onto Ptolemaic Middle and Far East plots. 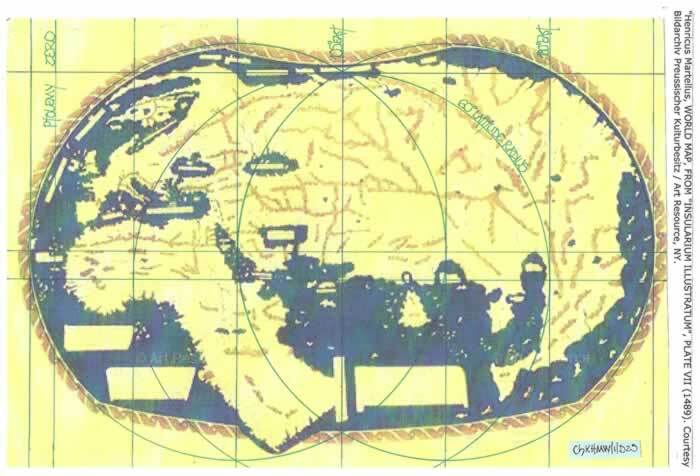 Then in c1491 he decides to reproduce the relatively small chart as a large scale world map, not knowing of course that the America’s existed, but still conceived a map being 280 degrees girth from 350 to 270 degrees Equatorial measure. If he, as we can see, obviously had the latest Portuguese data for Africa but chose to ignore it in favour of drawing NW Africa from the Strait of Gibraltar to the Gulf of Guinea some 15 degrees excess latitudinally, just what compelled such a monumental error to be drawn? Thus I can only ask the question; “what overwhelming data was presented to Martellus to lead to such an enormous error”? 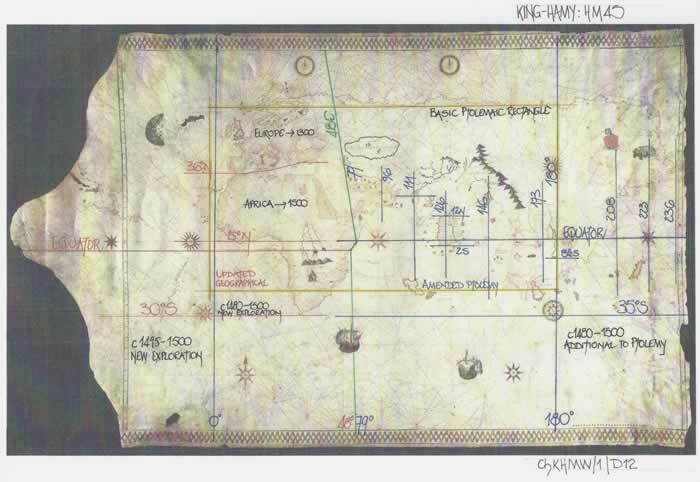 I can understand that a precursor to the King-Hamy chart with two Equatorial lines could seriously confuse the issue, and unfortunately have only found this example, nothing else; no loaded gun on a map that would answer the question. 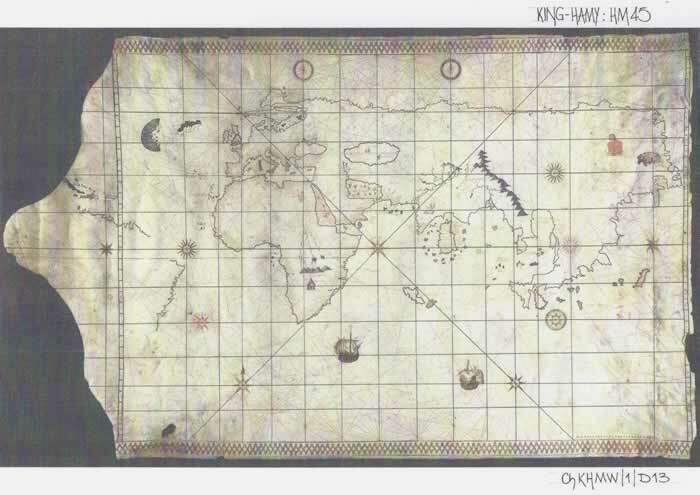 The historical context and descriptions of this world map are plenty and varied. A synopsis is that it was originally published in 1507 as “Universalis Cosmographia” and printed on 12 separate sheets as ChKHMW/1/D39, which if carefully cut to remove the bordure for each and properly aligned they can be joined to form a composite map, as ChKHMW/1/D40. 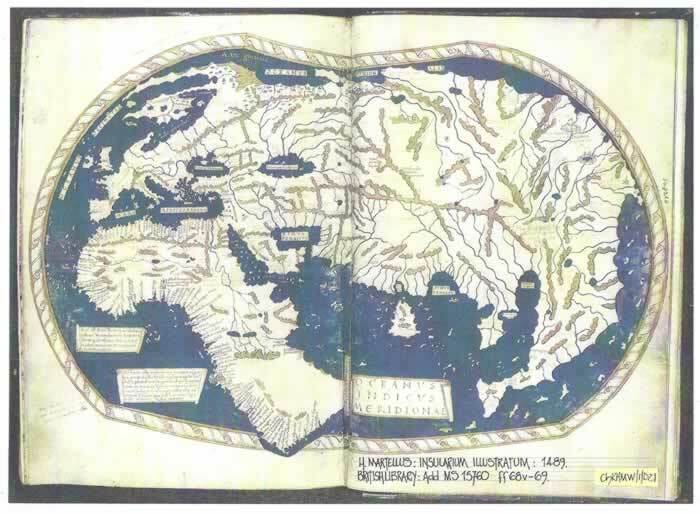 It is a basic Ptolemaic map which has had the latest explorations circa 1480 to 1500 added as M Waldseemuller and Matthias Ringman explain; “In designing the sheets of our world-map we have not followed Ptolemy in every respect, particularly as regards the new lands” ( taken from Cosmographia Introductio). I actually find the statement puzzling as Ptolemy did not know of the “New lands” and therefore could not have been followed. Thus we see an amalgam of the work of Claudius Ptolemy, c150AD with the latest data supplied by Amerigo Vespucci and the Portuguese. Therefore this text focuses on the physical chart, its methodology and presentation. It is often aligned with the H Martellus 1491 world map held by Yale University. 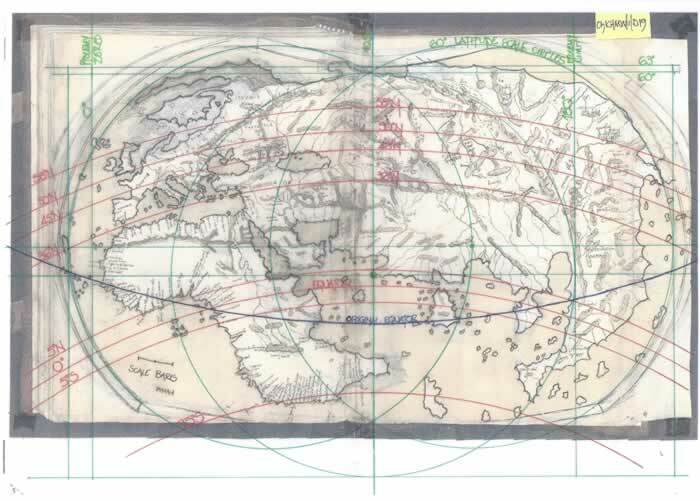 That map is described as being ”an innovative pseudo-cordiform projection, a modification of Ptolemy’s second projection” but if it was only described as “modified Ptolemy” then the false idea of pseudo-cordiform could be consigned to the dustbin. 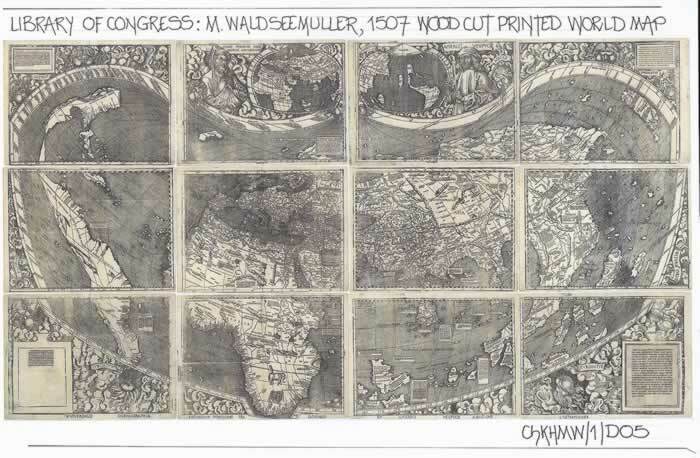 Thus when the Waldseemuller map is described as using the same projection it must be countered by a clear and definitive explanation of the form of the map. At the commencement of this text the Ptolemaic projections were drawn and discussed and thus it is the second projection that should be compared to this map. Thus the Waldseemuller map can be explained through the obvious pre-planning and draughting exercise required in setting down the whole curvilinear projection which then enabled the coastlines to be copied there-on. I commence by illustrating the first setting out of the bordure for the map which uses three major latitudinal curved lines, 66N, Equator, and 40S, with the Equatorial line having a radius of 180 latitudinal degrees as Diagram ChKHMW/1/D41. The length of the Equator is then marked off to 180 latitudinal degrees either side of the centre-line, and then the east and west bordure curves can be drawn until they meet the 66N limiting curved latitudinal line. 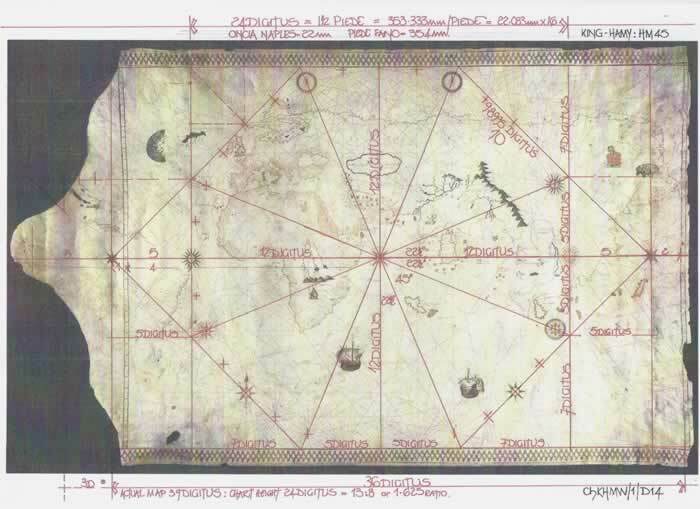 At this point in the construction the overall frame size for the map is chosen to suit the included cartouches. Obviously Waldseemuller at this stage was so enamoured with both Ptolemy and Vespucci that he determined a portrait and their world image should be included. But note, there is no land on the map above 66N except for a minor part of what is now Russia. Hence when the NW and NE corners are viewed they are totally void and thus un-necessary. 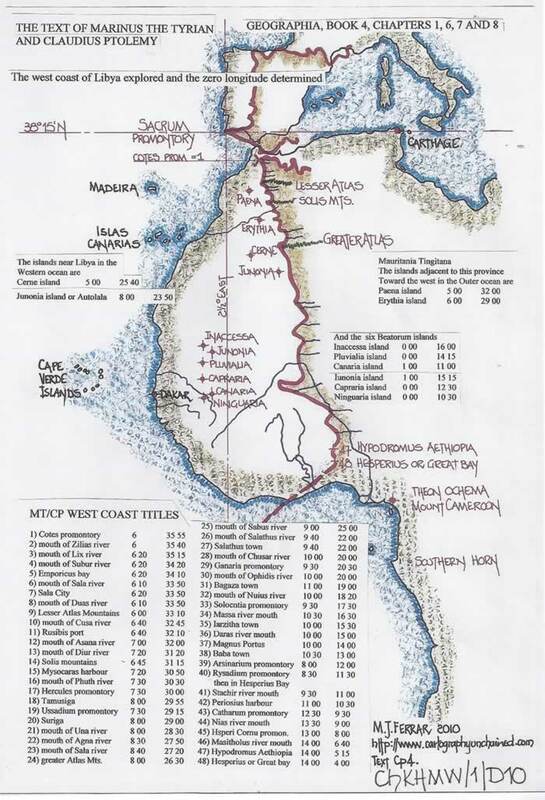 The simplest solution is to curtail the chart to encompass only the lands to be drawn and leave sufficient space for text and diagrams that are to be appended. Simply put, the NW and NE minor curves are sized to suit just the above facts with the central curves a geometric display delineating the two cartographers and their maps. 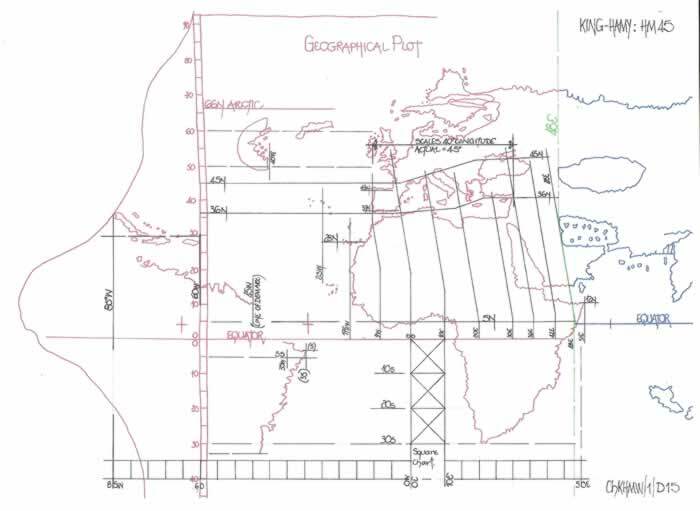 This is a pure design led concept ensuring the maximum use of the allotted parchments and is simply a matter of starting with Ptolemy’s second projection and amending it to suit the required design parameters dictated by the Geography; Pseudo-cordiform it is not! 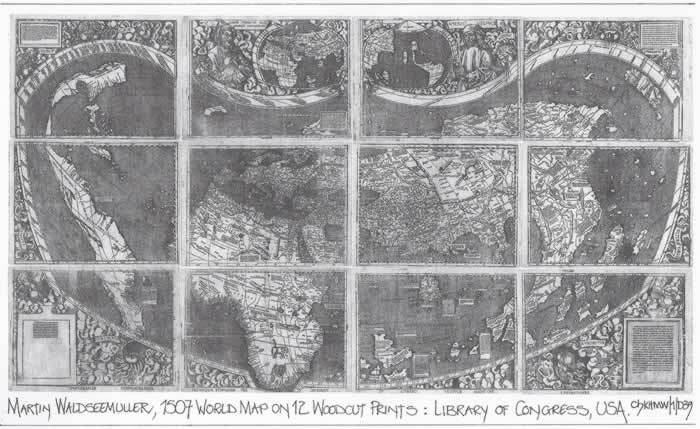 What we see today held by the Library of Congress is the composite of the 12 separate tiles and is actually nothing like the original map or its curvilinear original. You cannot draw a curvilinear based chart without having recourse to a “full” list of geographical co-ordinates, which of course did not exist and therefore the only basic tool available to enable a curvilinear chart to be drawn is to copy from a rectangular/square plot chart which will thus enable the transfer of coastline positions onto the curvilinear graticule profile. Thus the chart that would have produced the coastal form shown on the Waldseemuller 1507 map would have looked similar to the two appended diagram sheets (see D45 and D46) on which has been drawn that curvilinear coastline on a square graticule, which in this instance matches the King-Hamy 1502 chart for reasons of the African Problem. I have only included the western sections as they are the most pertinent to the whole charts being. Thus commencing from a square /rectangular geographical graticule to the drawing the curvilinear form can be achieved successfully and simply. Therefore the first manifestation of the Waldseemuller map is no doubt his plain chart collated from both Ptolemy and Vespucci, among others, and I suspect would not have been fit for publication as it no doubt included many alterations and amendments and even new sections glued over parts to arrive at a completed map for copying. Thus this is the map which enabled the curvilinear map to be drawn completely and then redrawn onto 12 tiles for the engraver to cut the woodblocks as Diagrams ChKHMW/1/D45 and D46 illustrate. This plain chart was also very important enabling the Gores to be drawn to accompany the text “Universalis Cosmographia” as well as the 12 tiles. 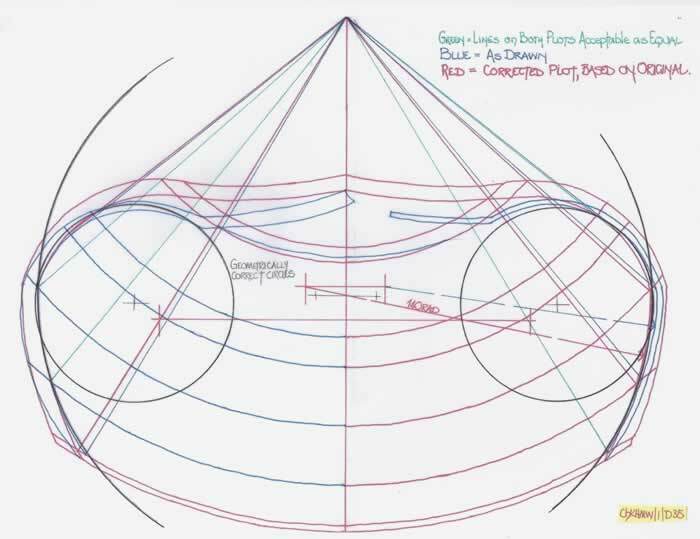 The Gores are drawn with a rectangular basic form and it is the cutting and splicing which forms the correct graticule when they are glued onto a wooden ball. But that first curvilinear map is unwieldy and rather difficult to draw as Diagrams ChKHMW/1/D42, D43 and D44 clearly illustrate. Consider these facts; the main curve, the Equator has a radius of 180 degrees of latitude and each 10 degrees on the full size chart is approximately 78mm and thus the radius is 18 x 78 = c1400mm or 1.4 metres radius. Consider the pair of compasses required for drawing the Equatorial radius; they must open to at least 1.75 metres to cover the 40S line and thus are likely to have had arms of the same length as the spread and thus the working height would have been some 1500mm. That is the most horrendously unwieldy pair of compasses imaginable to draw fine lines as you would require literally to stand over the map with the parchment laid out on a floor mounted board. There is an alternative and a very easy to use alternative and that is a Beam Compass with sliding shafts to enable alteration of the radius and would be eminently suitable as the reach from south to north , that is 66N would be just over 800mm and quite manageable. 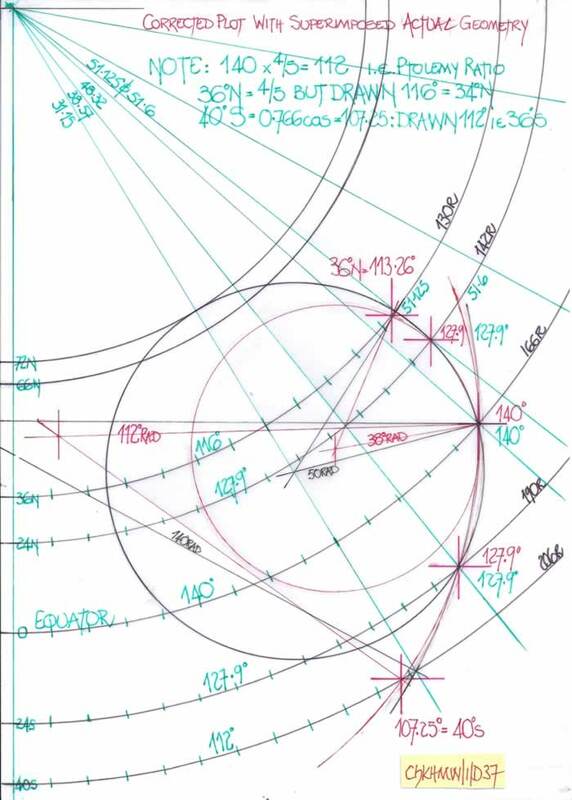 Hence this chart some 1380 x 2480mm required a base board at least 2000 x 2500mm with the parchment set at the lower edge thus the radius point would be on the board in the north and could be pinned properly for the Beam Compass to be manipulated from the south. Thus the latitudes are easily drawn and the bordure encompassing the two figures and their worlds can be drawn as those radii points are external to the parchment. The east west bordures and the longitudinal curves are all from centres within the parchment. 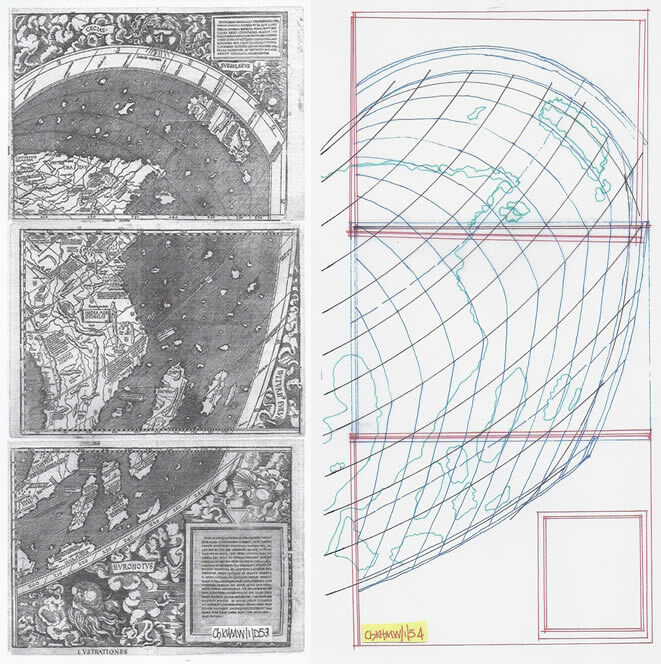 Therefore at this stage we have a fully formed curvilinear graticule on which to draw the coast line profiles and all other cartouche positions to ensure that it can be transferred correctly to the woodblocks. The next problem is the positioning of the wood blocks to be carved so that the curvilinear graticule, both latitude and longitude can be marked there-on preparatory to the coastlines being drawn on the blocks to enable the engraver to form the printing surface. If the blocks are identical in size then as the chart is symmetrical these lines can be drawn as is, and the necessity of reversal is negated. Once all the lines have been drawn the blocks can be removed and the original parchment map cut into 12 pieces matching precisely the blocks. The dissected map can then be reverse positioned after pinpricking vital markers for the coastlines etc, positioned over the block in reverse and then using the pin-pricked holes those salient points can be marked and the engraver can plain reverse copy the rest for the carving process to take place. Obviously the blocks are not large enough to accommodate the bordures for each and I suggest thin boxwood strips were affixed to the four edges and the lines and gradations then drawn to suit the curvilinear graticule. Thus the differences in the bordure forms are explained. We know that the SE and SW corner cartouches with the text there-on are additions to the chart as under the SW corner it is possible to see the original design showing through and the SE corner text is written on the reverse of an already used parchment the text of which shows through. This methodology also allows for the original chart form on the actual block to be amended as appears to have happened on the first west row, central tile. Therefore the originally hand drawn chart, full size and having the major features of coastlines, toponyms and illustrations becomes no more than 12 sections matching the wood carving in content. That is obviously why it possibly did not survive to be seen today. 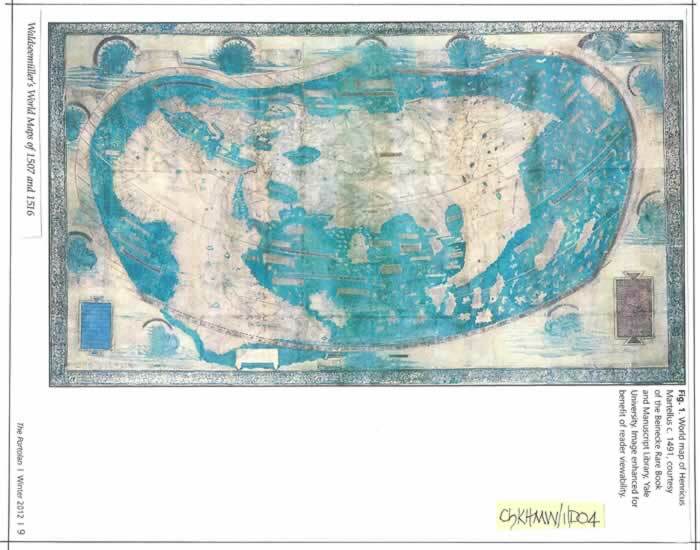 However, if after the carving process was complete it was glued together again on a backing sheet to reform the complete map, as it was possibly a work which Waldseemuller may have required to consult in the future. Would you waste such a tremendous amount of work? JOINING THE 12 PRINTED MAP SECTIONS. My next contribution, a contentious issue no doubt, is the manner in which the copies of the individual wood block sections have been joined to form a composite chart for the Library of Congress. From the previous section it will be obvious that only the actual map section of a tile is correct for this junction to occur and that can only be achieved by properly aligning the graticular curved lines and thus the coastal features should automatically align. That of course does depend on the accuracy of the carving, but if all the blocks were the same size originally then it is perhaps a simple task of re-alignment as described now. To facilitate this I drew the complete latitudinal curvilinear setting out including the bordures, centre line and re-aligned the tiles accordingly which proved that the tile borders were a complete mismatch drawn subsequent to the actual map form and awry therefore. There are four diagram plots matching the four vertical sections and each has had its individual bordure drawn there-on, colour coded to indicate the mis- matching lines. 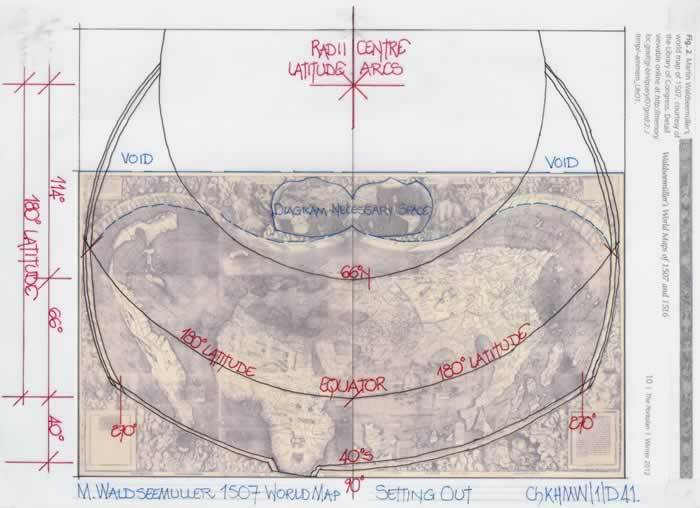 Four simple sketches show the overall setting out for each of the four sections by aligning them to the original and thus the coastlines can be drawn on those curved lines. I have explained this procedure as it is obvious that the composite map held by the Library of Congress has problems in its construction. 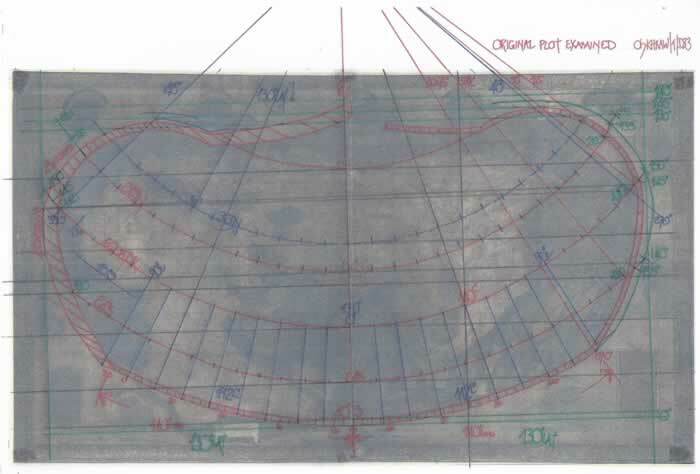 Thus should an accurate composite be required I suggest that the latitudinal curves, bordures and centre line are drawn out fully on tracing paper or plastic sheet and then the tiles slid underneath to align correctly but set out from the centre line not the bordures. 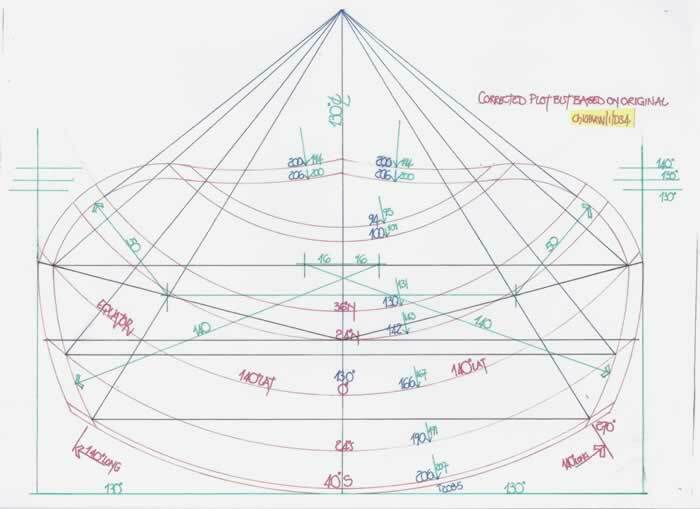 But also note the setting out of the latitudes actually starts from the Equator, the 180 degrees radius and the spacing of the 10 degree individual lines requires careful plotting as they do vary slightly in accuracy as drawn. 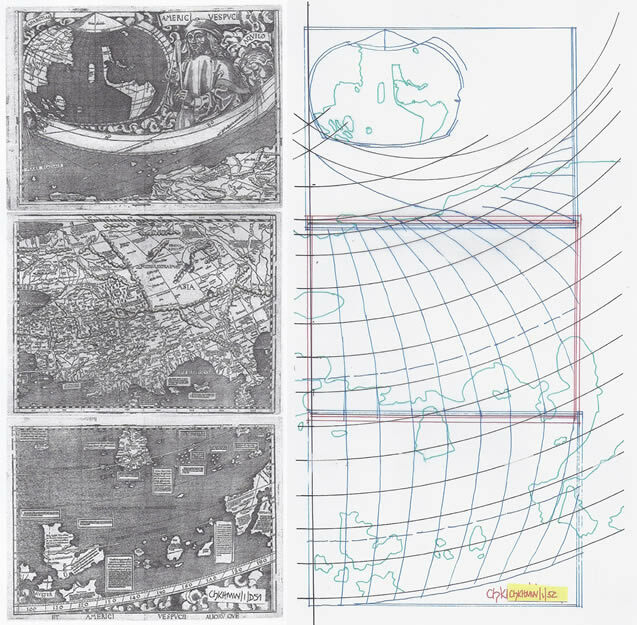 To make any comparison of the Waldseemuller 1507 world map with a standard Portolan type world map, the Waldseemuller plot must be redrawn on the same basis as the comparison map using the same graticule. The two diagrams ChKHMW/1/D45 and D46 shown previously indicate the western sections of the Waldseemuller map, which were redrawn to match the King-Hamy square graticule (in red). The following two diagrams are the matching section of the King-Hamy chart (in black), ChKHMW/1/D55 & D56. Finally the next two diagrams, ChKHMW/1/D57 and D58 show the King-Hamy/Waldseemuller maps overlaid, with Equator lines aligned and longitudinally to the Ptolemaic zero line. Both Geographical and Ptolemaic lines are indicated by their corresponding degree notation. There is obviously little if any conjunction between the two charts, and this was not expected to occur as the King-Hamy chart was only chosen as it adequately explains the Martellus and Waldseemuller error in the latitudes of the NW coast of Africa when they were so very well known from Portuguese exploration. 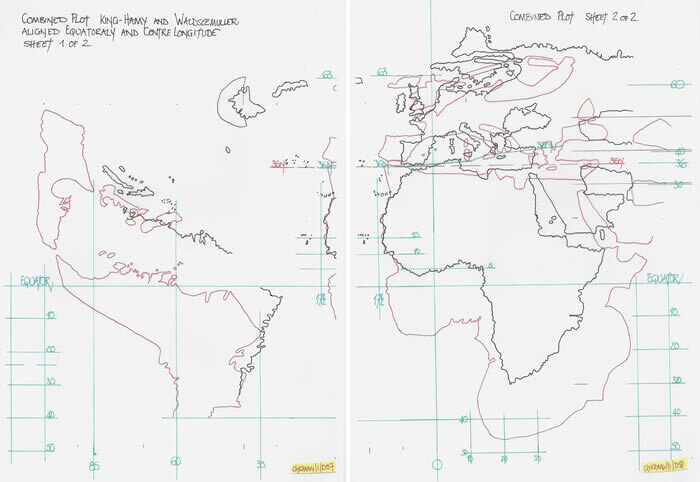 However the last diagram of this series, ChKHMW/1/D59, indicates that if the error is removed and the Waldseemuller map is overlaid again on the King-Hamy map, Africa suddenly becomes latitudinally similar and the longitudinal position of S America and the West indies is not only accurate but follows precisely the putative Zero longitude of the King-Hamy chart when the geographical graticule is appended. There is then a complete set of longitudes from 100W to 40 E, which ignoring the putative geographical plot used as a guide in fact indicates that the longitudinal measure was very good indeed. By adjusting S America 10 degrees north wards to omit the error as drawn, then the north coast of S America becomes latitudinally near correct to the geographical, but as with all other maps and charts Hispaniola and Cuba are again totally awry. At this juncture in the examination of these maps I decided to include this abstract from Dr Peter Whitfield’s “New Found lands” page 65, as it raises questions I have not seen dealt with by others and allows for my comments to be appended. I have already written about the La Cosa 1500 chart and shown that it is a combination of an earlier Portuguese chart for its eastern section and a newly drawn western section for the America’s. The Cantino chart is likewise a cobbled together chart using two different originals, which indicates that there was more than one copy of Cantino and that would no doubt have been available in Iberia should Waldseemuller have visited. 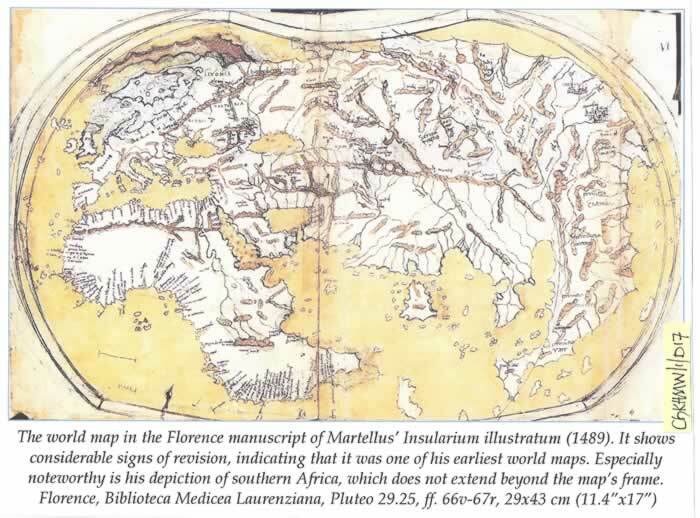 However at least Dr Whitfield has described the 1507 map as a Ptolemaic basis rather than the outlandish statements made by others regarding pseudo-cordiform. Thus the 1507 chart has a predecessor plain chart, possibly sectionalised in that the Ptolemaic chart could have been drawn centrally, then the African Portuguese data added including the Far East which appears similarly on earlier charts, and finally the western section, the America’s was added. Thus putting it all together was not an onerous task, but drawing its curvilinear form was a tedious geometrical construct as after the simple latitudinal lines are drawn, the longitudinal lines all required to be set out individually, although the same radius could be used twice across the centreline for matching degrees. The following table is taken directly from the original text as printed and can be shown to serve as a possible reason for some confusion in the draughtsmanship of the map. It is not clear if this table is the work of Martin Waldseemuller or Mathias Ringman, or a collaborative text, but it requires explanation as it is in error, large and small. If I rewrite the table it will show the vagaries of the mathematics and the enforced errors. Thus only 5 out of 12 figures may be considered accurate enough to provide adequate data for the latitudinal measurements, but there is an unfortunate mistake also. Thus the whole table is an average of the Gradus latitudes as best calculated then. But, the Milia Italian at 60 per degree is in fact the Milia Geographicus of the equivalent 5:4 ratio from 75 Roman Miles per degree to 60 Milia Geographicus and hence it is 1.25 times the Roman Mile , that is from 1.4791KM to 1.853KM and is of course therefore 10 stades to the Roman Mile of 8 stades. When is a mile not a mile, when it’s a different mile! For any researcher who finds this hard to understand I suggest they read my text MsFER/1, which discusses the work by Jaime Ferrer in 1495 to position the Line of Demarcation where he completely invents a new measurement by mis-using the Stades numbers of antiquity, to be followed by Jean Fernel in 1528 with the same absurdity and a measurement of the degree of latitude. Confusion about MILES having the same name is the main culprit for many errors. Firstly, the King-Hamy chart was obviously not available to Martellus and probably not seen in one form or another by Waldseemuller. However the double Equatorial lines are probably a carry-over from the first attempts to marry Ptolemy to the Portolan chart and if the precursor to the King-Hamy chart was in fact drawn with a greater Equatorial spread of the two lines then it is possible it influenced Martellus and then Waldseemuller. Speculation, no doubt, but for both of these world maps some 16 years apart to illustrate a similarity in errors the over-riding data must have been very persuasive indeed. Thus the King-Hamy chart has been used for illustrative purposes only. The second conclusive section must deal with the Martellus 1489 printed charts and their inverse Ptolemaic first projection. 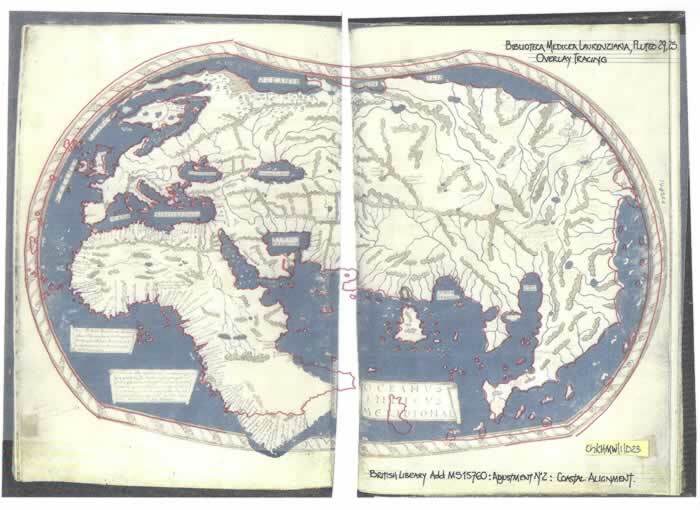 It is quite obvious that Martellus saw the anti-clockwise slewing of the Mediterranean Sea on a Portolan Chart and realised it could not be properly shown had the standard Ptolemaic projection from the north been used. However, by following the skew of the Mediterranean Sea down through Africa he has at least drawn it in a near geographical manner. Thus he has simply reversed the projection and drew the curved latitudes from a southerly centre point. 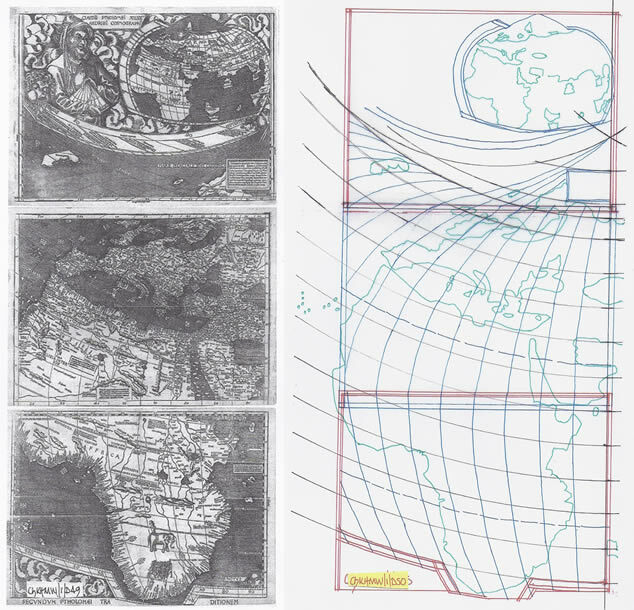 No doubt had Ptolemy known of the large landmasses south of the Equator he would have thought similarly and produced two versions of his first projection to enable it all to be drawn correctly. This point equally applies to the second projection by Ptolemy had it been required. 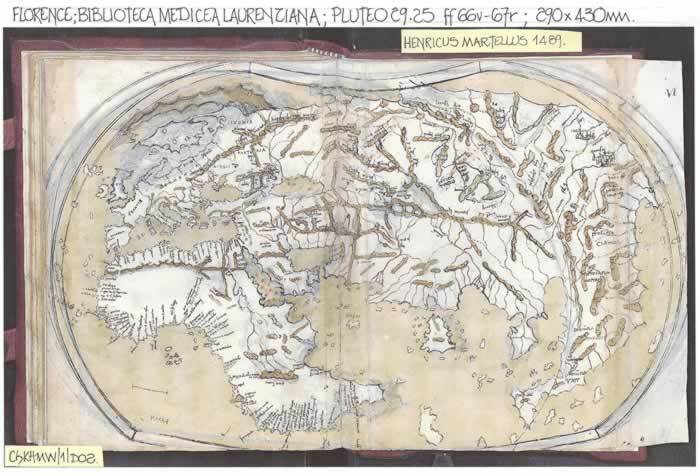 The third conclusive section now deals with the Martellus 1491 world map which is drawn to the Ptolemaic second projection. Martellus has cleverly used the longitudinal readings as his radii, 130 and 140 degrees for the setting out of the latitudinal lines. He has simply used circles to plot the overall framework, and thus it is no more than a geometrical exercise as has been clearly shown. Unfortunately accuracy was lost in this setting out, but the overall effect is still quite acceptable. But, and it is a large but, why did Martellus change the excellent African profile for which is a good geographical presentation for the totally awry North West African coastline he has drawn? Unfortunately I have no answer only the possible confusion shown by using a double Equatorial line as on the King-Hamy chart. 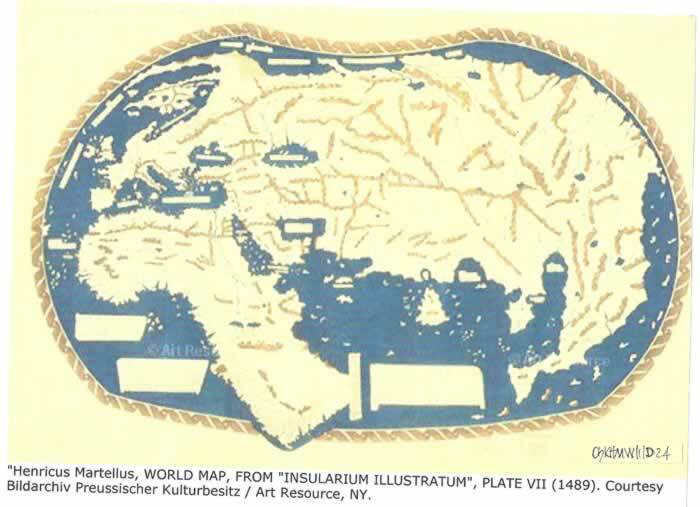 Note; neither the Martellus world curvilinear map nor the Waldseemuller world curvilinear map could have been drawn without recourse to a plain rectangular/square plotted map which is used to copy onto the curved graticular format. Thus these maps are part of the missing history of this genre as a curvilinear map cannot be drawn from memory, it is copied out. 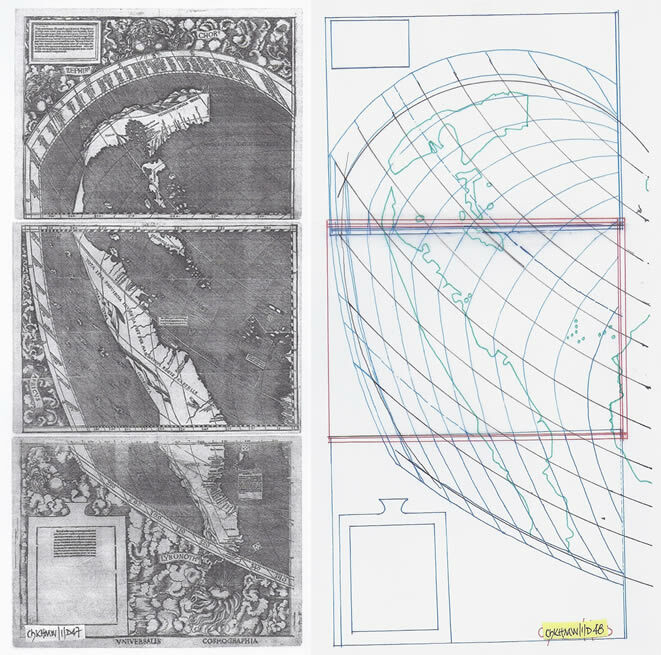 The fourth conclusive section now deals with the Waldseemuller 1507 world map which is again drawn to the Ptolemaic second projection and is clearly another geometrical exercise in draughting. The fact that it is printed on 12 sheets led Waldseemuller into an extra-ordinary amount of work. I believe there must be at least two precursors to this curvilinear map drawn by Waldseemuller, and in all probability they were used later to frame his 1516 plain world chart, the Carta Marina held again in the Library of Congress. The 1507 Map is a tour de force but as my studies have shown it is simply set out from the Equator with a 180 degree radius and then from the centre line of the geometric construct on which is set the radius point for the latitudinal curves. Finally, the nomenclature of previous researchers should be consigned to the dustbin and recognition given solely to the Ptolemaic First and Second Projections used by Martellus and Waldseemuller without recourse to others. Michael J Ferrar, September 2018.